Public Health Week 2012 Proclaimed In Cannon Co.
Cannon County Executive Mike Gannon, right, signs a document proclaiming April 2-8, 2012, as Public Health Week in Cannon County. The statewide celebration of Public Health Week 2012 has the theme “A Healthier Tennessee Begins Today!” and hopes to increase awareness and hopes to increase awareness and understanding of the relationship between prevention and health outcome in our communities. Promoting health and quality of life of all Tennesseans through prevention is a major goal of public health. Public health services benefit Tennessee’s entire population and are essential ingredients in a strong, successful health care system. Public health activities protect citizens from infectious diseases, environmental hazards, chronic diseases, unintentional injuries and violence. Public health professionals and others who promote public health play important roles in providing for the health and welfare of our county and state. 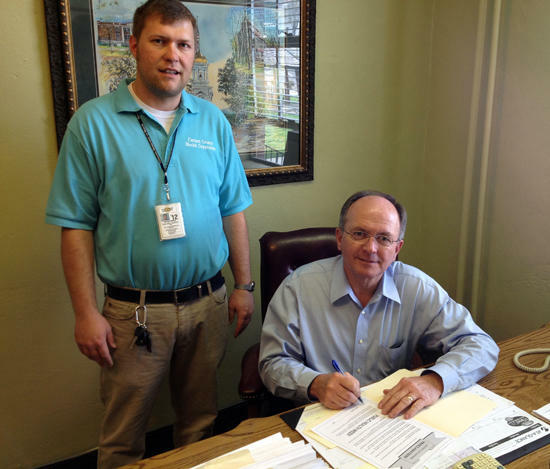 Joining Gannon for the signing of the proclamation is Michael Railling of the Cannon County Health Department.